There is nothing more frustrating than to have memorable unedited moments within your life, captured by your own "personal touch" photography and videography, and no idea on how to blend them together into a wonderful presentation to share with family and friends or save in your own family archives. hoedl's haven productions© is committed to assisting you in creating just such a personal production that vibrantly captures your memories to last a lifetime. To begin your memory to last a lifetime, visit the link above Getting Started and then email your initial ideas to Lee Hoedl. You will receive a personal reply that will assist you in further advancing your raw photographic/videographic material into a powerful moment to cherish in the coming years. 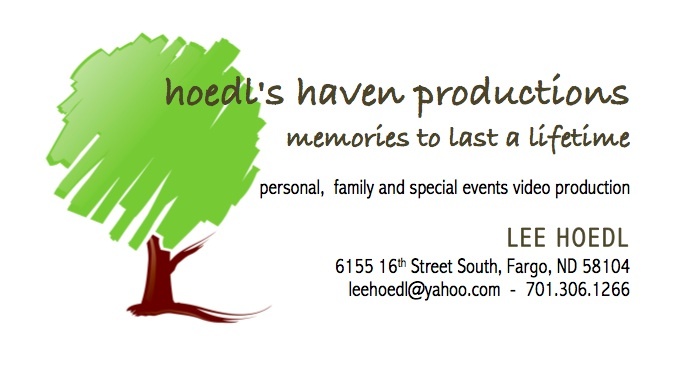 You are also invited to contact Lee Hoedl at 701.306.1266 to begin your memory to last a lifetime.